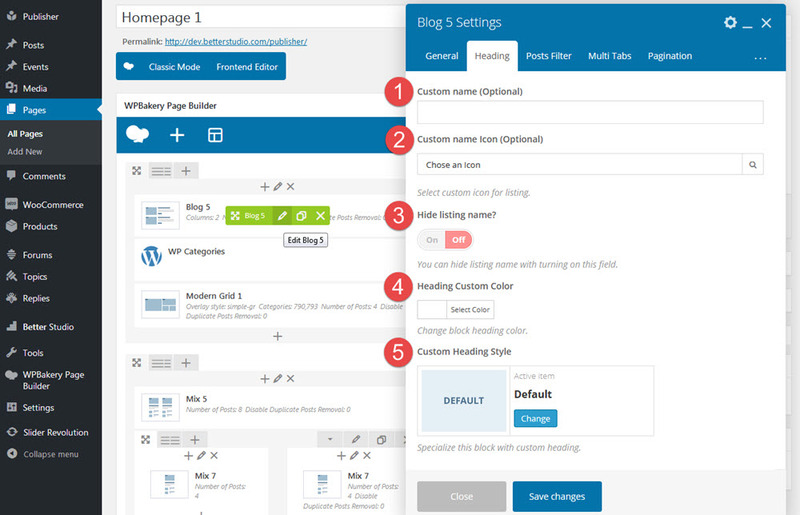 There are 34 different heading styles for widgets and content blocks in Publisher. Select a default style for headings and override it in single block/widget if you want. See demo of all heading styles. Click onChange and select between 34 different styles. 1- Custom Name: Select a name for this block. It can be shown as block title. 2- Custom Name Icon: Select an icon for showing beside block’s title. 3- Hide listing name? Hide or show block title. 4- Heading Custom Color: Change block heading color. 5- Custom Heading Style: Select a heading style for this block. By selecting “Default”, it uses default heading you selected in theme options. For overriding heading style in widgets read widgets global options.